If you answered that a podium is some variation of a stand with a slanted top used to hold notes for a speech, you should keep reading. A podium is a small, raised platform used by people like orchestra conductors or sports medalists who place first, second and third in an event. If you’ve ever heard someone talk about getting on or off their soapbox, that is a great example of a podium. The purpose of a podium is to elevate one’s standing position. By now, you’re probably thinking, if that thing with the slanted top isn’t a podium, what is it? My friends, it is a LECTERN! 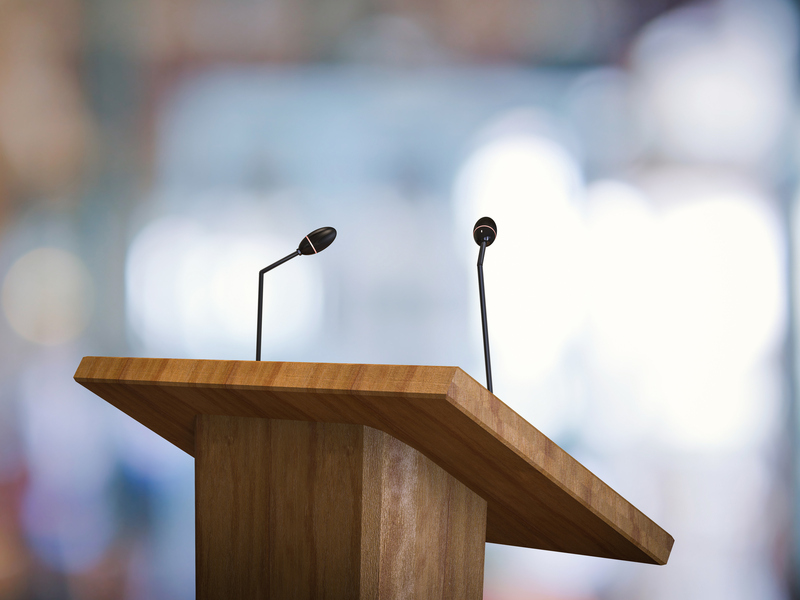 Now that you know the difference between a podium and a lectern, here are a few tips to help you use a lectern more effectively. Nervousness causes speakers to interact with the lectern in strange ways. Have you ever seen someone lean on one like they were leaning on a car? (Funny) Or how about my favorite, when they grip the top sides of the lectern and unconsciously tap along while swaying from side to side like they’re playing a pinball machine? The majority of bad lectern habits can easily be broken by standing back one foot (12 in.) from the lectern. At that distance, you can easily see your notes and, with your feet planted, you won’t be tempted to lean forward because doing so would throw you off balance. Adjust the microphone as soon as you approach the lectern, keeping in mind that it does not have to be directly in front of your mouth. Adjusting its height is most important. Your notes should always be printed in a big font, front side only. This keeps you from flipping pages. Slide each page from right to left as you progress through your talk. This way, your audience never sees your notes. Lastly, move from behind the lectern. Take command of the entire stage when appropriate. Oh yeah, if you’re ever at a venue and you can’t get on stage because it’s too high, ask for a podium.